Leiber, Fritz. The Big Time . Ace. Summary: Timeline warfare between Snakes and Spiders as each side tries to eliminate the existence of the other. Series note: Various tales on a theme, but only The Big Time , "No Great Magic", and "Catch that Zeppelin!" contain allohistorical content. Other entries in the series may be found in The Changewar , Gregg 1983, and Changewar , Ace 1983. Leiber, Fritz. The Big Time . Tor 2000. Leiber, Fritz. The Big Time . Translated to the French as Le grand jeu du temps , Masque. Summary: At a Snake enclave somewhere outside space and time, a soldier preaches ChangePeace as the enclave maintainer disappears. Series note: A Changewar story. Published: Ace 1961; Gregg 1976 (0839823347); Amereon 1983 (0884119319); Macmillan/Collier 1991 (0020698410); SFBC 1992; Buccaneer 1998 (0899685374w88 android); Tor 2000 (0312890796BUY). — Originally serialized in Galaxy , March and April 1958. — Included in Ship of Shadows , Gollancz 1979. Translation: Nederlands by H.J. Oolbekkink as In de Macht van Morgen Born 1973 (9028303642). 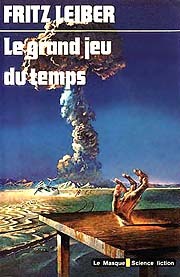 Translation: French by Hervé Denègs as Le grand jeu du temps , Le Masque 1978. Translation: German by Thomas Schlueck as Eine große Zeit , Bastei-Lübbe 1982 (3404230116). Translation: Italian by Riccardo Valla as Il grande tempo , Nord 1975 (8842903167). Translation: Portuguese by José Sanz as A História é Outra , Expressão e Cultura 1973. Translation: Spanish by Domingo Santos as El gran tiempo , Hugo 1958, Adiax 1982. Translation: Swedish by Ingela Bergdahl as Den högre tiden , Delta 1982 (9172283114). Awards: Winner: 1958 Hugo for best novel. Leiber, Fritz. "No Great Magic"
Summary: The Snake vs. Spider battlefield moves to an anachronistic performance of MacBeth before Elizabeth I. Published: In Galaxy , December 1963; The Secret Songs , Rupert Hart-Davis 1968; The Changewar , Gregg 1978 (0839824939); The Great Science Fiction Series: Stories from the Best of the Series from 1944 to 1980 by Twenty All-Time Favorite Writers (eds. Frederick Pohl, Martin H. Greenberg and Joseph D. Olander), Harper & Row 1980 (0060133821); and Changewar , Ace 1983 (044110259X). Translation: German by Tony Westermayr as "Macbeth und Queen Elizabeth", in Spekulationen , Goldmann 1976 (3442232295). Leiber, Fritz. "Catch that Zeppelin!" What if: The son of Marie Sklodowska and Thomas Edison invented an electric cell which lead to pollution-free automobiles, and a change in the outcome of World War I created a more humane and scientifically advanced Germany. Summary: Caught by the Change Winds, the author finds himself in a 1937 New York, meeting his historian son for lunch and discussing points when history might have turned for the worse. Published: In The Magazine of Fantasy and Science Fiction , March 1975; The Worlds of Fritz Leiber , Ace 1976 and Gregg 1979 (0839824777); The 1976 Annual World's Best SF (eds. Donald A. Wollheim and Arthur W. Saha), DAW 1976; Nebula Winners Eleven (ed. Ursula K. Le Guin), Harper & Ship of Shadows , Gollancz 1979; Row 1977 and Bantam 1978 (0553117424); The Hugo Winners, Volume 4: 1976-1979 (ed. Isaac Asimov), Doubleday/Foundation 1985 (0385189346), SFBC 1985; The Best of the Nebulas (ed. Ben Bova), Tor 1989 (0312931751); The Leiber Chronicles , Dark Harvest 1990; The Way It Wasn't: Great Science Fiction Stories of Alternate History (ed. Martin H. Greenberg), q.v. ; and The Mammoth Book of Alternate Histories (eds. Ian Watson and Ian Whates), q.v. Translation: German by Birgit Ress-Bohusch as "Versaeum nicht den Zeppelin! ", in SF Jubilaeumsband - Das Lesebuch (ed. Wolfgang Jeschke), Heyne 1976 (3453311124); Das Geschenk des Fakirs (ed. Manfred Kluge) Heyne [[date unknown]] (3453303563); Die 20 besten SF-Stories (ed. Jonathan Gates), Goldmann [[date unknown]] (3442250293). Translation: Spanish by José María Pomáres as "Coge ese zeppelin", in Ciencia Ficción selección 24 ([[editor unknown]]), Bruguera 1976. Awards: Winner: 1976 Hugo for best novella.